Profile: Dr. Nate Hathaway received a BS in Biology and a BA in Chemistry and Philosophy in 2001 from Case Western Reserve University in Cleveland, OH. He received attended Harvard Medical School (Cambridge, MA) in the Biological and Biomedical Sciences program and received his PhD in Cell and Developmental Biology in 2007. Dr. Hathaway then did his postdoc at Stanford Medical School (Palo Alto, CA) for the HHMI & Departments of Pathology and Developmental Biology until 2013. 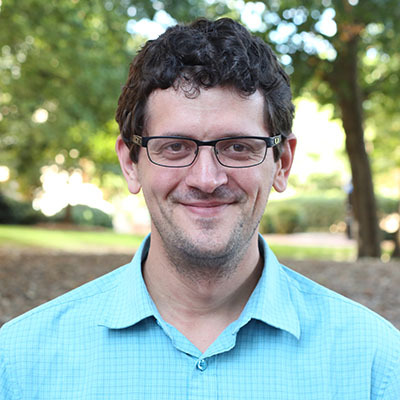 Currently, he is an assistant professor and a member of the Center for Integrative Chemical Biology and Drug Discovery and the Lineberger Comprehensive Cancer Center at the University of North Carolina, Eshelman School of Pharmacy in Chapel Hill, NC. Abstract: The Hathaway lab uses a combination of chemical-biology and cell-biology approaches to unravel the molecular mechanisms that govern gene expression. We utilize new chemical tools wielding an unprecedented level of temporal control to visualize changes in chromatin structure and function in mammalian cells. In addition, we seek to identify small molecule inhibitors that are selective for chromatin regulatory enzymes with the potential for future human therapeutics. This seminar will detail new inhibitors of heterochromatin gene repression that have been identified by a cell based high throughput screen. These inhibitors have been used to discover new molecular components of the heterochromatin gene repression pathway. Secondly, we will detail a novel deactivated Cas9 based technology developed in the lab that combines small bi-functional molecules to recruit endogenous epigenetic machinery to a specific genetic loci and cause changes to chromatin structure and gene expression.